The mud wrestling and cursing are over, for today. 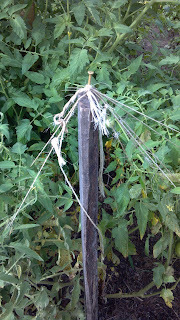 The short version: tie up your tomatoes early if you are going to stake them. Notice the "if?" Turns out, staking is not as critical as OCD gardeners would have you believe. Nature's design works just fine. If you are getting your garden's picture taken, you might want to stake them. Like getting out the good towels when company comes. a little more foot room for picking, the production of the staked vs. loose tomatoes appears identical. Fertilizing is easier around the staked tomatoes. Blossom end rot has been a problem in the past so boiled, ground eggshells were added to the fertilizer twice. All the tomatoes have yellow leaves at the bottom to spite the fertilizer. I think they are the result of the 40 days and 40 nights of rain. Many tomatoes are growing on the ground at the bottom of the unstaked tomatoes, but they have not rotted and are now starting to turn red. Who'da thunk it?! I gave up on some ideas and idealism as the rain continued. Even a small break now means mowing, not staking. Saw one end of scrap lumber into a point. Pound it into the ground between overgrown tomato plants. Make sure it is deep and sturdy. Drill a long screw into the top. Thread twine under and around your tomato plants and tie it into a loop. Pull the loop up and hook it onto the screw. Nothing says REDNECK like some Beverly Hill Billies Tomato cages! Ok, there are a couple other things that might. SO Easy Kid's Pesto recipe! I Can't Eat The Tomatoes?!?! Beans, Beans the Musical Fruit! Beans, Beans They're Good For Your Heart! Time To Start Planning - Like A BOSS! Squash Have Gender - Apples Are Hermaphrodites. Happy July 4th! What Should We Plant? !